Storyline: One day, Sylvester Duncan, a donkey youngster, finds an unusual looking pebble, small and red, that he takes it to add it to his collection. While studying it, he discovers that the pebble has magic powers, precisely that it fulfills any wish as long as you hold it. Excited, he runs home to tell his parents. But on his way home, just about Strawberry Hill, he meets a hungry lion and because he panics and cannot think clear, he wishes he was a rock (so the lion won’t see him and eat him). And so, his wish comes true. The lion, puzzled, goes away. 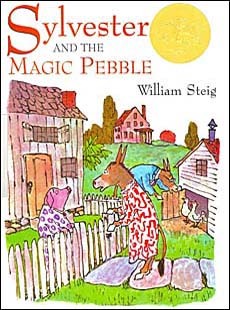 At which point, Sylvester realizes that he is, indeed, a rock and that he cannot touch the pebble resting just by, on the ground, to make himself a donkey again. Fear, despair, sadness follows. He comes to the conclusion that to become himself again someone must find the red pebble and wish for the rock nearby to be Sylvester. Chances were “one in a billion, at best”. At home, his parents, Mr. and Mrs. Duncan were still waiting for their son, Sylvester, who had never missed dinner, to show up. But when the morning came they decide to ask the neighbors if they had seen Sylvester, and even go to the police. But nobody had seen him. They start a search and soon all the dogs in Oatsdale sniff every corner, bush, tree or rock, even the one on the Strawberry Hill, but turns out no result. They search and search, days and months, but nothing. Meanwhile, Sylvester got used to being a stone and fell into an endless sleep. Seasons passed by and he barely knew it. One day in May, Mr. and Mrs. Duncan decide to try to enjoy life again and go on a picnic. They choose Strawberry Hill and stopped by the rock that was Sylvester. Mrs. Duncan sits on the rock, while Mr. Duncan wonders around. He finds the red pebble and put it on the rock, where they have set up a picnic table. Sylvester, feeling the warmth of his mother, finally wakes up. He was happy, although he couldn’t express it. While they were eating, Mrs. Duncan tells Mr. Duncan that she thinks their son “is still alive and not far away” and she wishes he was there with them. Father said nothing but Sylvester, with great sadness, wished he were himself again. And because he wished that and because the magic pebble was on the rock, he turns into himself, to the great joy of his parents. And so, the story ends, the three of them hugging tightly, with the red pebble stored in a safe. Characters: Sylvester, Mrs. Duncan, Mr. Duncan, the lion, other animals as supporting characters. Illustration: Steig is also the illustrator of this book. His work is simple yet clear. The animals are pictured as modest as possible but they move the story along, enriching the settings through small details or emphasizing the action. The colors are vivid with lots of green, red and blue. Overall this is a great classic storybook. PS: It is said that this book was banned in some parts of the United States because of depiction of the police officer as a pig. (Note: all characters are different animals).